The upright stems of T. hirta Miyazaki Hybrids are lined with white blooms that are speckled and spotted with maroon. They show best when planted near a path, where their amazing blossoms can be admired at close range. Gardeners seeking plants for shade are always pleased to discover Toad Lilies. 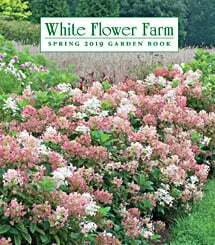 Despite their common name (probably suggested by the spotted blooms), they offer striking flowers and produce them in fall, when most shade gardens could use a point of interest. Tricyrtis make excellent cut flowers (in Japan, they are grown commercially to supply the florist's trade). Plants prefer evenly moist, slightly acid soil. i did not register. my fault. items all arrived and fine. ordered two types. one is fine but this genus did not survive the winter it seems. did i do something wrong? I've owned this plant for at least 10 years now and really enjoy its cascading branches covered with the orchid-like flowers that grow down the center. It blooms at a time of year when most perennials are winding down. This plant is a shade lover, low growing, and doesn't seem to be bothered by insects or diseases. Slow to multiply, it doesn't require constant dividing. Plant Tricyrtis in partial shade or shade and evenly moist, slightly acid soil.